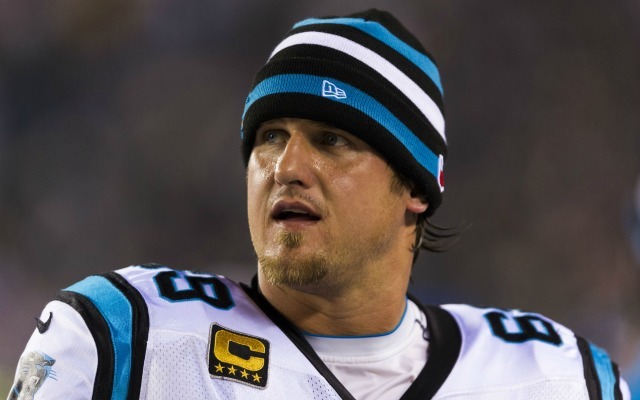 Jordan Gross retired after a long and distinguished career with the Carolina Panthers. His great, goofy, oddly uplifting podcast is his happy legacy. During the 2013 NFL season we learned a lot -- actually, way too much -- about the interpersonal dynamics of an NFL offensive line. There was a disgusting epoch in the middle of the regular season when, even if alls you wanted out of the NFL was a certain brand of background noise for your lazy Sunday doze, you couldn’t not hear about the increasingly vile… well, what: conflict? bullying? unorthodox and ineffective team-building methods? between Miami Dolphins linemen Richie Incognito and Jonathan Martin. Now that the dysfunctional duo is more publicly recognizable than even a Hall of Fame lineman like quiet giant Jonathan Ogden, the only thing that can be said with certainty about the balance of their careers is that their presence on another roster will be greeted with the rankest bile from the darkest, dankest corners of the internet. Nobody wins, here. With their NFL-emblazoned paychecks no longer cut every two weeks, vocal former players were eager to pipe up about the relational desolation within the game. Chris Kluwe raged that he was released by the Minnesota Vikings simply for his politcal activism on gay rights. Nate Jackson moved many a unit of a largely jaded and cynical memoir that chronicled his NFL experience. The wrenching conversation and more-wrenching inertia on brain injuries continued apace. Watching and supporting the NFL has never felt queasier but there’s good news here. My message here is one of positivity: There’s a chunk of media out there, available to the public, curated and delivered to by a real live NFL player, that will turn your frown all the way upside-down. That player is Jordan Gross, who was until he retired earlier this week the starting left tackle for the Carolina Panthers; the media in question is his weekly interview podcast, This Is Gross. Without any prior geographical, familial, or emotional affiliations to the Carolina Panthers, I’ve gone eagerly through and listened to all 33 episodes. I feel better for it. I feel better in general, and better about the prospect of watching NFL games. I heartily recommend the Gross cleanse for all morose pigskin fans. It works. This Is Gross is an interview show, topping out at one 20-minute episode a week, with each episode featuring a new Panther as interviewee. Since the show has churned along more or less every week since last April, the easily recognizable Panther names -- Cam Newton, Steve Smith, Luke Kuechly -- got used up pretty fast. This means that most episodes feature players only familiar to the die-hards: Geoff Hangartner, JJ Jansen, Travelle Wharton (Gross’ neighbor and carpool buddy), Richie Brockel, and many others up and down the depth chart. These are the people and personalities who actually make up a football team. Football is discussed on the show, but only some of the time and only incidentally, mostly because the two men speaking were introduced to each other through football. As the episodes progress from spring workouts, past the slow summer, through training camp and then through Carolina’s wildly successful 12-4 regular season, the laid-back mood of the show never changes. Playing catch-up with the episodes, I never could tell if a particular episode followed a Panthers win or a Panthers loss. Even defensive line monsters like Greg Hardy, Dwan Edwards, or Charles Johnson project nothing but seemingly authentically sunny and relaxed vibes in their episodes -- the opposite of what I (unfairly) expected these hulking sack behemoths to be like out of uniform. Jordan Gross: So. It’s the end of November. The Panthers are 6-3. The fans -- 7-3 [laughs]. Sorry. Uh...and the Panthers fans are going crazy, so I say let’s feed them what they want. Welcome Graham Gano. GG: I’m giving the fans what they want. It is happening right now. Don’t mistake Gross’ factual error as symptom of a flippant attitude towards the game or his team. He cares a lot: in 2013 Gross restructured his deal to take a pay cut and then performed well enough to be named a Pro Bowl alternate. It’s just that Gross, along with pretty much all of his interviewees, is not so wholly consumed by football as to struggle discussing anything else. It is, instead, the working component of what seems a comfortable, interesting, well-adjusted life. It seems you don’t have to slide very far down from the top of the NFL payscale before you find dudes who -- game days aside -- live fairly wholesome and good-natured thirtysomething. JG: After the game, some of the guys like went out to dinner after, and it was super late. I was like, I gotta go home, because, come 6:30, I gotta take the kids to school. And so we got home and it was like, just what you would picture an NFL player being after a big Monday Night Football game. Head home, uh, pay the babysitter who was watching the kids. There’s no food in the fridge hardly, so I scrambled some eggs with some cheese ‘cause that’s all I could come up with. Meanwhile my wife’s making the lunches for school tomorrow. And then I go to bed at like two watching highlights after I let the dogs out. You know it’s like, I was thinking, this is not what people would think would be happening after this game. These are small moments, but not trivial ones insofar as they remind listeners that these players are not Tolkien’s orcs, bashing each other over the head until their spittle-spewing leader commands them to bash the heads of an opposing clan. Gross makes playing for the Panthers feel like an extended trip to summer camp -- an experience built out of a thousand small moments, memories that are pleasantly endorphin-releasing years after the fact. I say that selfishly I’m doing this, because I wanna have recorded conversations with my buddies 15 years from now, when we’re all, y’know, done playing and scattered all around the place and I haven’t talked to anybody for a long time. If I’m gonna do a road trip from our, now our home of Charlotte, to our hometown of Fruitland, Idaho, and I’m driving cross-country, I’ll probably slip in, you know, the uh, whatever format it is at that point in time and listen to these episodes, because it’s so much fun. The only other thing that Gross talks about more than Fruitland is his best friend on the team, center Ryan Kalil. Invited to teach at an offseason camp this past summer in American Samoa by Troy Polamalu, Kalil and Gross actually did it, a unifying act of football diplomacy. On their post-trip podcast, the two Panthers were significantly more interested in rehashing Gross’ singing performance at the Governor’s Ball after Kalil wrote his name on the sign-up sheet -- blessedly, the performance has been posted to YouTube. Gross’ serenading of the Governor of Samoa et al. serves as a microcosm of his whole career: Gross has let football to take him to see places and meet people that he never would have met otherwise. Once he got there, he graciously and happily rolled with all of the pranks and silly nonsense that transpired, and generally had a blast. This week Jordan Gross retired from the NFL, meaning, among other things, that January 8th’s episode with Byron Bell could be the last-ever episode of This Is Gross. Plenty of Carolinians and I would appreciate more episodes of the show, just as we’d appreciate more seasons of Gross starting at left tackle. But in both pursuits Gross has already built a complete and lasting canon; in both cases, he is going out on top. Gross’ farewell press conference illuminates the power that the warmth of his character brings to a situation: after a blustery non-anecdote from owner Jerry Richardson, punctuated by the most nervous of laughter, and then some cardboard coach-speak from Ron Rivera -- so stiff in front of the assembled media compared to his own episode of This Is Gross, where he chatted amiably about his interest in World War II history and told crazy Mike Ditka stories -- Gross took the podium. He almost immediately melted into a puddle of appreciative tears, sentimental in what seemed the most authentic and sincere way. Gross played a photo slideshow to thank teammates past and present, and seemed just as engaging, self-deprecating, and immediately likable as he is on his podcast. No number of NFL seasons have made Gross aspire to be anything other than what he is: a solid, goofy dude from Fruitland, Idaho. The press conference concluded as it should have: with Kalil ambushing the conference with a trio of barbershop singers (posing as journalists) and singing Gross a farewell tune. This is a harsh game and an ugly business, but there’s a happy lesson in Gross’ career and happy self: he approached the game with a kind heart and a gentle spirit (and Pro-Bowl talent) and the game returned those things to him in kind. Even with a life’s savings in his bank account and Fruitland awaiting, it may be strange for Gross to sleep in this fall instead of getting up at six to drive with Travelle Wharton to another day at the facility with his teammates. This Is Gross leaves a sort of legacy to Panthers fans that extends beyond its host. The team is easier to love for those who know Greg Olsen’s nonstop, chattery humor or Jordan Senn’s in-meeting yoga regimen or about Jonathan Stewart’s bedroom beat-producing. In conversation, they reveal themselves as humans; the show makes these players, and the Panthers in general, feel more real and fun than just about any other team. We can only hope, for everyone’s sake, people like Jordan Gross aren’t the exception in NFL locker rooms, but the rule. Miles Wray writes a recurring column for McSweeney's Internet Tendency called Reviews of Self-Help Books by Professional Athletes and helps create Spartan. He's on Twitter at @mileswray.